I’m finally almost recovered (even though this cold is certainly more ambitious than I was hoping) so it seemed like a good time to write another blog. On Sunday night, we went to see Argo in English. Great film – I understand the criticisms of it but it’s difficult to deny that it’s tense and well-directed. Monday morning saw me laid in bed feeling very sorry for myself and thinking ‘please don’t make me have to go to school today’. Apparently luck was with me because I promptly got a call telling me that school was closed due to a heating malfunction. I have to admit to being a bit happier about this than I probably should’ve been but I very hardly ever miss work with illness and I hadn’t been going to let myself that day so I don’t feel too bad. I actually ended up at the cinema twice, firstly to see Beautiful Creatures (Sublimes Créatures) which I hated and later to see Hotel Transylvania which is utterly brilliant. On Tuesday evening I saw new French comedy 20 ans d’écart. From my experience, French films are normally hits or misses with very little in the middle and 20 ans was brilliant. It was funny, the right length and featured some great performances. Pierre Niney from the Comédie Francaise was particularly good. On Wednesday, I received the exciting news that we finally have a house for next year! It’s been tricky trying to find one from France and Mexico but it seems to be all sorted at last, mostly thanks to the wonderful Donné. Nice house with a friendly private landlord in the perfect area for both university and work – awesome. In the evening we saw Zero Dark Thirty in English. I love Jessica Chastain and thought she put in an excellent performance. The film’s good but it’s long and I think I’d have to psych myself up to watch it a second time. The bulk of the week was spent writing formal letters in French to begin cancelling the many things which I’m subscribed to here – exciting stuff! Things improved an awful lot on Friday when I went with Deauville to stay with my colleague Patrick and his lovely family. Deauville is a beautiful and incredibly affluent town, a favourite of royal families and movie stars. Connected to its less affluent twin city of Trouville-sur-mer by a bridge, it really is the St Tropez of the north of France. The town has two film festivals each year, the Asian Film Festival in March and the American (read: Hollywood) Film Festival in September. It was the 15th Asian Film Festival of Deauville that provided the reason for my visit. Having lent me a suit jacket (up to this point, unnecessary in France), Patrick and I headed to the International Centre of Deauville (CID) for the festival. The venue was beautiful. 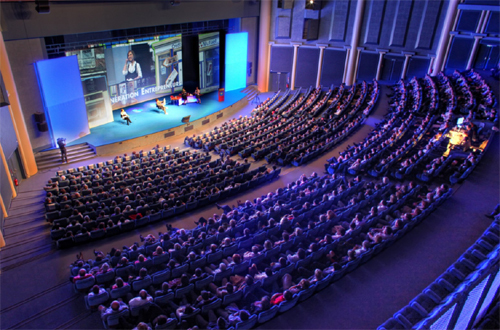 The entrance is on the edge of the beach and the screening was in the main auditorium of the conference centre, l’auditorium de Michel d’Ornano, which is actually underneath the beach. We watched a martial arts demonstration, an homage to the film’s director Wong Kar-Wai, a speech from the director himself and finally the film. It was called The Grand Master and, although I’m not sure what I made of the story, it was absolutely beautifully shot. After the film we went for pizza at a small restaurant in Deauville which was one of the best meals I’ve had so far in France. It was unbelievably light, the kind of pizza I wish I knew how to cook at home. The next day Patrick made me lunch, giving me the opportunity to try some new French foods that I’d never had before. One of the foods I tried for the first time was veal, which I really liked. After lunch, we went to Beaumont-en-Auge which has a beautiful panoramic view over the Touques Valley and to Trouville-sur-mer in order to explore the more popular of the two towns. We also visited les planches in Deauville, the town’s equivalent of the Hollywood Walk of Fame. It was a really lovely trip and it was a shame to return home at the end of the day. Sunday mainly involved spending a lot of money. I bought myself a ticket for The Book of Mormon to go with the Matilda tickets I’d bought earlier in the week, as well as various trains for the adventures I have coming up over the next few months. Oh… and a trip to Barcelona. I’m going for 4 nights in June with Ellie as an early celebration of my 21st birthday and I can’t wait. On Sunday afternoon, the assistants headed to Le Sirius, the cinema which principally shows films in their original language with French subtitles, to see Lincoln. I would like to put it on the record that I absolutely love this film. I think it’s a master class in sustaining quality from the beginning to the end of a movie and Daniel Day Lewis really is just superb. I’d say his was certainly one of the most deserved Oscars of recent years. The experience was, as normal, ever so slightly marred by my on-going war with the lady at The Sirius who speaks in English to me but in French to all of the other assistants and, frankly, is just rude. Soon I shall be back in England and no longer need her cinema. In the meantime, I shall continue to watch as many films as possible in French at The Gaumont where there’s more choice and the staff are much friendlier. The north of France is currently snowy. The vast majority of schools were closed yesterday and I think they all are today. We have over a foot of snow in places and no public transport. Eurostar, ferries and national trains have also been cancelled. Yesterday, my school was one of the ones that stayed open resulting in me having to get a taxi to and from work – I actually lost money by going in! Apparently there is now an estimated 8cm of ice underneath the snow which will prevent the tramway from reopening until Thursday at the very earliest. This weather had better shove off soon. I’m experiencing cinema withdrawal.